Organic onions make up 1% of total organic produce sales, even though fewer than 3% of onions overall are organic in 2015. Their sales are rising steadily. Sales rose by 4.4% in 2016. Include organic onions as part of your produce mix to capitalize on their popularity as a staple in many homes. For more information on variety characteristics, visit our conventional bulb onions page. Because onions are actually grown under the soil, play up the growing methods for organics in your marketing. The idea of fewer pesticides on their onions will play well with health- and environmentally conscious consumers. Organic onions offer a host of promotion opportunities as they are nearly always eaten with something else. Include organic onions in promotions with organic meat, organic green peppers and other stir-fry vegetables. Add them to soup promotions with other organic items as well as with organic bagged salads. 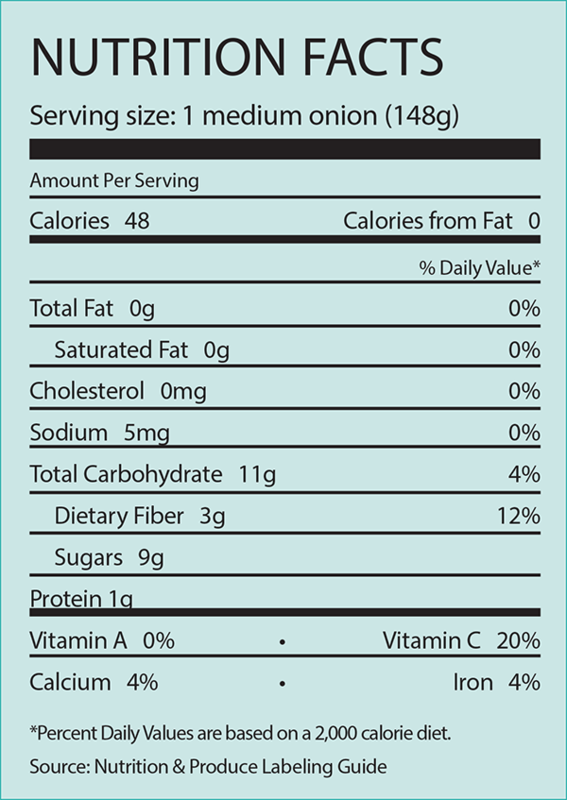 Include organic onions in football game-day and grilling promotions as a topping for burgers. Consider a secondary display near organic meat to increase sales during these seasons. Organic onions are available in red, white and yellow, so include all three on your display. Consider placing organic potatoes next to organic onions as they are often bought together. Create a row of onions and potatoes by placing organic product on one side of the aisle and conventional product on the other. This makes it easy for shoppers to see all their options. Keep organic onions away from misters as they spoil quickly when wet. Onions also do not need refrigeration. Onions skins can make your display look messy. Keep an eye on the display and remove loose skins as needed. Waterfall displays work well for organic onions as it brings the product closer to the consumer. Don’t stack onions too high as they can roll off the display creating a hazard for shoppers. Organic onions are sold both bagged and loose. Common containers for organic onions are 40-pound cartons and in cartons of 16, 3-pound bags. They are also available in other sizes, including custom packs. For the short time onions are held at retail, they are usually not refrigerated. They need a dry atmosphere and too much humidity induces decay. Onions draw moisture from vegetables they are stored with, which may also cause decay. Stack onions to provide good air circulation. If in bags, stack in a crisscross manner leaving air space across the middle. Cartons should be stacked. Just 6% of consumers who purchased onions said they exclusively purchased organic onions. However, another 12% of shoppers who bought onions said they purchased both conventional and organic onions.